Have you ever wanted to control something powerful or have you ever needed to turn on/off a high power device from your Arduino or another low powered microcontroller? 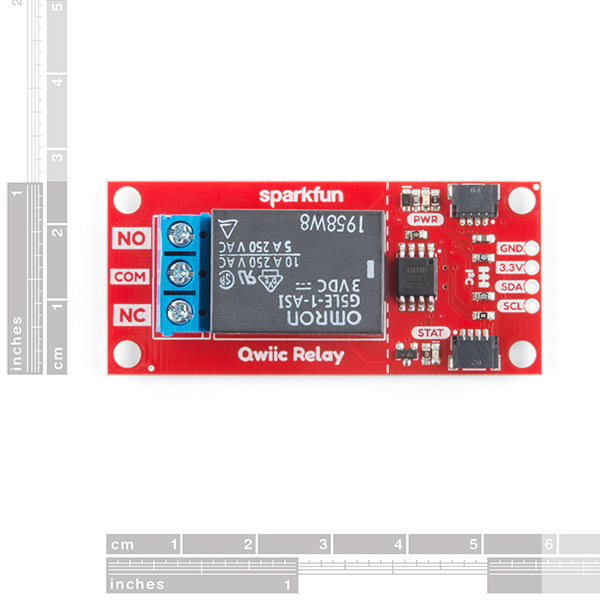 The SparkFun Qwiic Single Relay provides you with the easiest to use relay yet. The Single Relay board can handle up to 5.5A at 240VAC for long periods of time and allows you to control large power loads with simple I2C commands. Utilizing our handy Qwiic system, and on-board screw terminals, no soldering is required to connect it to the rest of your system! 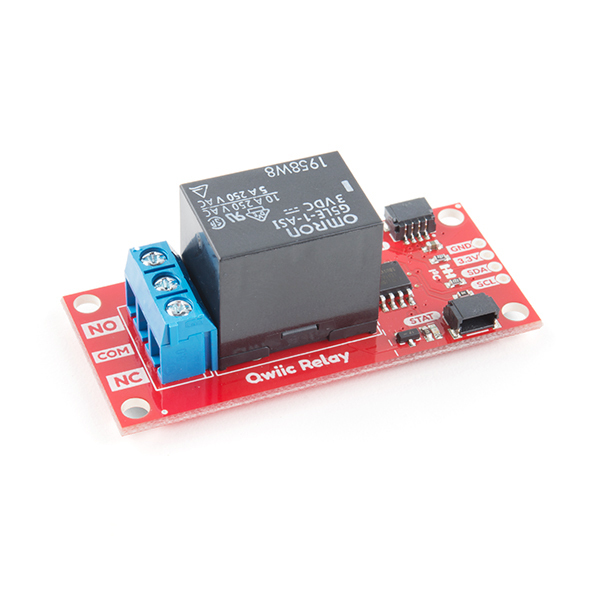 The Qwiic Relay comes with a default I2C address of 0x18 but can be changed with a simple command allowing you to control over 100 Qwiic Relays on a single bus (but please be aware that toggling lots of relays on a 3.3V bus can cause voltage spikes so an external power supply will be required)! In addition, there is an address jumper on the back of the board. Closing this jumper with solder will change the address to 0x19. We've included many safety precautions onto the PCB including, ground isolation between the load and the low voltage control has been increased and an air-gap has been added around the common pin. The traces between the relay and the NC/NO/COM terminals have been doubled to increase the maximum current. But if you aren't comfortable playing with high voltage AC, that's understandable. Please consider using the IoT Power Relay, instead. 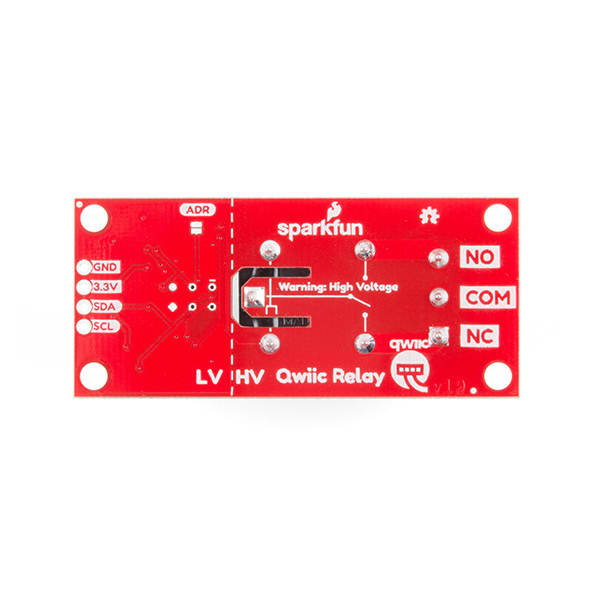 It's not I2C supported but the IoT Power Relay contains shielding to prevent accidental shock and is great for learning how to use relay power accessories. Nice little board, very convenient! Python versions of the example code would be appreciated for this and the quad board. Thanks! I'm having some trouble with this relay. When I don't have anything hooked up to the terminals, it turns on and off fine. However, when I have a 12v supply attached, the relay turns on, but won't turn off. While it's in this "stuck on" state, it also won't return its current status (send 0x05, and then request byte). Anybody had this issue? Can the power led be turned off somehow to conserve energy? Sorry theres no easier solution. I've been debating on making the power LED jumper-removable but haven't done so. Think it's a good idea?